Anti-apartheid struggle icon Albertina Sisulu was a “rock” to her family and contributed greatly to the nursing profession and to South Africa’s liberation. She should be memorialised for this, and society could emulate her in many ways. 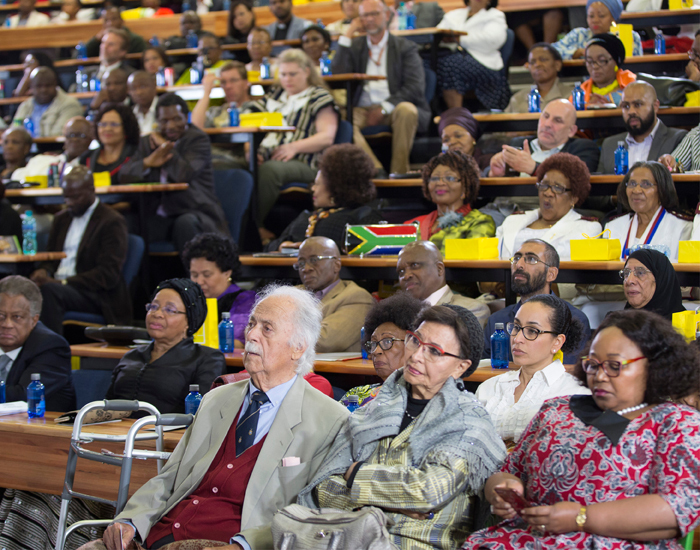 These were some of the thoughts shared by humanitarian and former First Lady Graça Machel when she delivered the Albertina Sisulu Centenary 2018 Memorial Lecture at the University of Pretoria’s Health Sciences Campus. 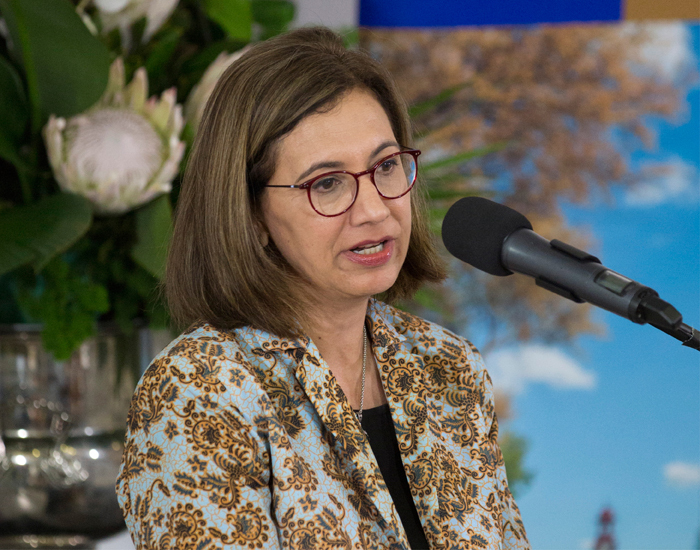 The event was attended by government officials, struggle stalwarts including the Sisulu family, Advocate George Bizos, and the nursing fraternity. Mrs Machel paid tribute to MaSisulu, who would have been 100 years old this year. MaSisulu was married to ANC stalwart Walter Sisulu, and in 1964 she was left to care for her children when he was sentenced to life imprisonment on Robben Island. Despite bannings, police persecution, imprisonment, as well as the torture, detention and exile of her children, she continued to work as a nurse while remaining active in the ANC. Vice-Chancellor and Principal, Prof Cheryl de la Rey at the lecture. Her husband was released from prison in 1989 and, after the unbanning of the ANC in 1990, her children returned from exile. MaSisulu was elected to the first democratic parliament in 1994, and retired in 1999 to devote herself to community work and caring for her husband, who passed away in 2003. She passed away on 5 June 2011 in Johannesburg. Mrs Machel said MaSisulu “reinvented herself as her circumstances evolved. She chartered a course from village girl to national and international icon”. For Mrs Machel, MaSisulu “was a bridge-builder and she went beyond the partisan”. She worked across political lines. She taught society that “when there is a good cause to be fought for, do not be divided by politics. Work for the common good.” Mrs Machel said there needs to be a greater focus on how people can work together for the “betterment of communities”, rather than focusing on differences. She said MaSisulu and Walter “stood shoulder to shoulder… they supported each other emotionally, financially and politically,” pointing out that this should still be the case in today’s society, which has seen a change in the roles traditionally designated to men and women. While some professionals do not help out in the home, society should “fully value and respect women as an equal partner”. Furthermore, “she moulded the values of equality, freedom and justice in her children at a young age. She groomed her children with a sense of purpose.” She was an anchor to her family while her husband was in prison and “kept her family cohesive and united”. Mrs Machel bemoaned the idea that South Africa is a fatherless nation, referring to a report by the South African Institute of Race Relations that indicated that half of South Africa’s children are growing up without a father. Furthermore, only 33% of children live in a home shared by both parents. She said society needs to have male and female heroes: the whole year was spent on focusing on former president Nelson Mandela’s centenary year, but only in October was it decided “let’s celebrate maSisiulu”. Human rights lawyer Advocate George Bizos was among the dignitaries at the lecture. The lecture was hosted by the Albertina Sisulu Executive Leadership Programme in Health (ASELPH), a partnership of the University of Fort Hare, the University of Pretoria, the Harvard TC Chan School of Public Health; in collaboration with the National Department of Health. ASELPH provides high-quality strategic leadership training to healthcare managers.